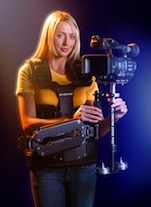 The addition of the vest and support arm should make using the Glidecam 4000 Pro system easy to endure more than five minutes. The Glidecam 4000 pro is newly designed with a no-tools telescoping center post, a sleek and light base which allows quick attachment and dynamic adjustment with the counterweight disks. Includes a foam handlegrip, light gimbal and a compact main bearing assembly. The vest helps support the weight of the system and the articulated arm absorbs body movements allowing smooth camera handling. This stabilization system works gracefully and professionally. Producers will see why the idea of making a camera glide through the air isn't just a dream, it's a reality. The Glidecam 4000 Pro will easily supports smaller cameras like our Panasonic HPX170. It is quick and easy to set up and balance. Allows unrestricted booming and unrestricted 360 degree panning. This rig should be considered for projects that can use an increase in production values with dynamic pictures. Note: camera operator shown in photo not included.